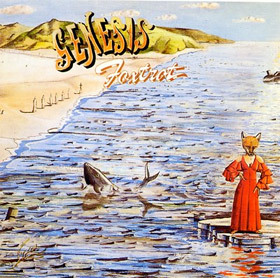 October 1972 | Genesis - "Foxtrot"
The winter of 1971 was one of discontent after the unspectacular release of Nursery Cryme. After five years of untiring work and many disappointments the band did not really feel they had made that step ahead. In January 1972, however, they could unexpectedly see the light at the end of the tunnel. The light came from Belgium where Genesis’ second album topped the charts. This led to their first invitation abroad – and their TV premiere. The band realized that they did not have to focus on their home country to be successful. Soon after they received more surprising news: Their current album had already made it to #4 in the Italian charts. Knowing that the number of their supporters had grown so much gave the band lots of self-confidence. Tour obligations in England did unfortunately not permit them to make their Italian fans happy by playing concerts there right away, but the summer break in the UK proved very convenient. In August a collective of musicians who had become more mature, more experienced and more self-confident went into Island Studios in London to record their new material they way they wanted it to sound. Things had changed since Nursery Cryme. The musicians had really become a band, they had established their own style and also their sound. Genesis could have produced the album themselves (and would have liked to) because no-one knew better what the band wanted than the band themselves, but Charisma insisted that an external producer be brought in. This did not sit very well with Phil: “Charisma thought we needed a producer, and we made it difficult for everyone because we knew we could do it ourselves. From the middle of Supper’s Ready, from Apocalypse In 9/8 onwards we started to sound really good on record.” The fired producers were Bob Potter and Tony Platt after him and they could not stand either the music or the musicians. In the end, Genesis found a good team in David Hitchcock and a technician and Genesis fan called David Burns. Tony Stratton-Smith, their manager and boss of Charisma, had tears in his eyes when he first heard the completed recordings for the album: “They’re going to make it with this record!” were his words to Richard Macphail, a close friend of the band. Foxtrot was released in October 1972, and everybody agreed that this simply had to be the breakthrough for the band. Fans and critics alike deemed it a masterpiece and took it to #12 in the UK charts. It had become clear that this band could not be ignored anymore, especially not at home.